Rob Schmitz writes about the residents of Changle Road and personifies modern day Shanghai (and to an extend, China) through these different generations and backgrounds. The focus on a single street is clever, and the stories are compelling. Street of Eternal Happiness is also both a good history lesson as well as a context-provider of today. But at the same time, it does feel too broad. It glances over the same details that have been written about before in much finer detail and way before Schmitz set foot in China (looking at you, Wild Swans), namely the Great Leap Forward, the Famine, the Cultural Revolution and the regime by Xiaoping. While the individual stories (much like Wish Lanterns) about CK and Zhao are interesting; to read three chapters on a bickering old couple is an annoyance. It is a shortcoming that much about their story is spend on their bickering, and not their history in building up Ürümqi in Xinjiang. Schmitz is adding to the rising stereotype of Western journalists living in China that either make a documentary about the country or write a book about the people they’ve met. 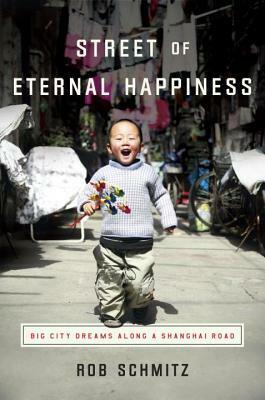 Street of Eternal Happiness is a good book (and great if you’ve never read a thing about China). Yet to me it feels like something I’ve read before and better.